Disney Skyliner: Until Further Notice: Disney have embarked on creating a new transportation system. 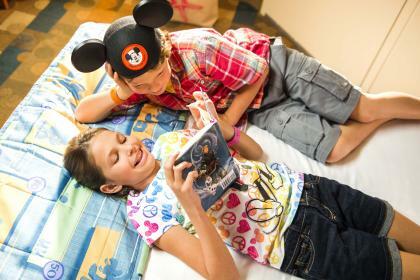 Disney Skyliner, which will give Guests a bird's-eye view of Walt Disney World Resort while travelling via gondolas. 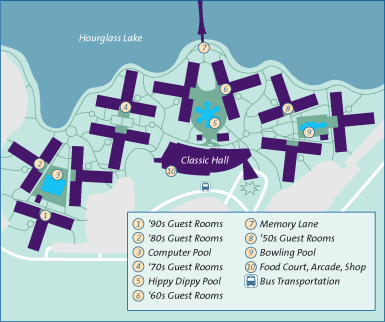 During this time, construction may be seen or heard throughout the resort, but noise should not be heard from Guest Rooms between dusk and 9.00am. 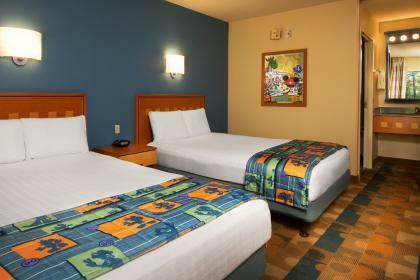 Take a trip down memory lane at this wonderful Disney resort hotel celebrating pop culture of the 20th-century. Relive the fun, fads and fashions from giant juke boxes, huge yo-yo’s, Play Doh & the Rubik's Cube. 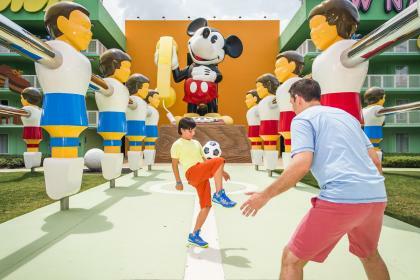 Disney’s Pop Century Resort is a fantastic family favourite, where you are welcomed by a 23 foot tall Roger Rabbit; there is plenty to delight every member of the clan at this lively resort. 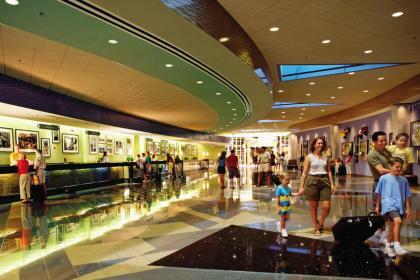 The memorabilia crazes and catchphrases that defined the 20th Century are everywhere you look - from jukeboxes, bowling pins and 8-track tapes to laptops, mobile phones and VCRs. 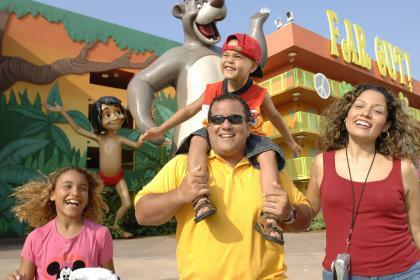 Giant icons are something to look out for, as well as huge models of Disney characters from the different eras. 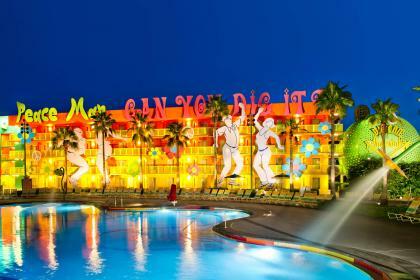 Each building is a larger than life 'time capsule' of pop culture, featuring slogans encouraging you to 'boogie on down' or 'have a nice day’! 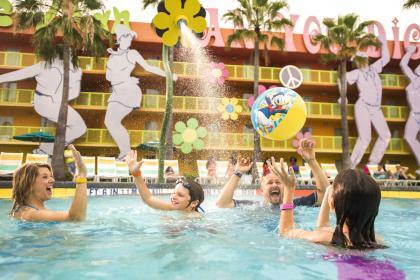 The resort has three pools, one main pool, the Hippy Dippy Pool where kids can splash for hours and two smaller, quieter pools one in the 50’s and the other in the 90’s area of the resort. 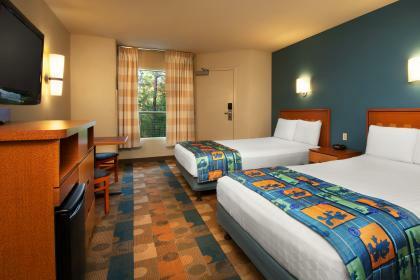 Rooms are comfortable and offer basic amenities such as a safe and a TV showing Disney movies. 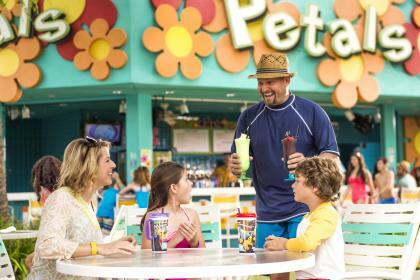 The Everything Pop Shop & Food Court, is the place to be, where the kids can enjoy their favourite food, whilst mums and dads will appreciate a cocktail in one of 2 bars. 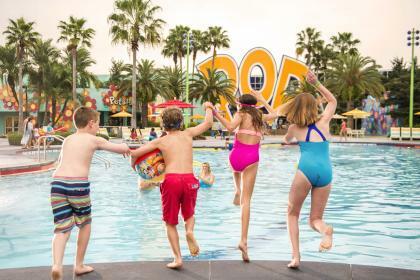 Disney’s Pop Century Resort really does offer great value for money for a family Disney holiday, plus you have the benefits of being on-site within the Walt Disney World Resort. Breakfast, lunch and dinner. 7 different stations serve tasty dishes including sandwiches, salads, burgers, hot dogs, chicken, pasta and pizza, together with cakes, pies and cookies. You can also savour the resorts specailities of oven fired flatbreads, rotisserie turkey and traditional home-made desserts. Provides poolside drinks and snacks.